Quartz surfaces are a smart and more modern alternative to products such as marble and granite for countertops, vanities, wall cladding, floors and other interior surfaces. Quartz surfaces are resistant to stains, scratches, cracks, heat and common household chemicals. The surfaces retain the cool, tactile qualities of natural stone, while offering unlimited design possibilities. 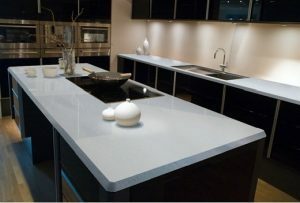 Quartz comes in large slabs which provide sleek and modern aesthetic by minimizing joints and therefore low maintenance. Quartz surfaces never need sealing and require very little maintenance to keep them looking like new. The hard, non-porous surface makes cleaning simple.